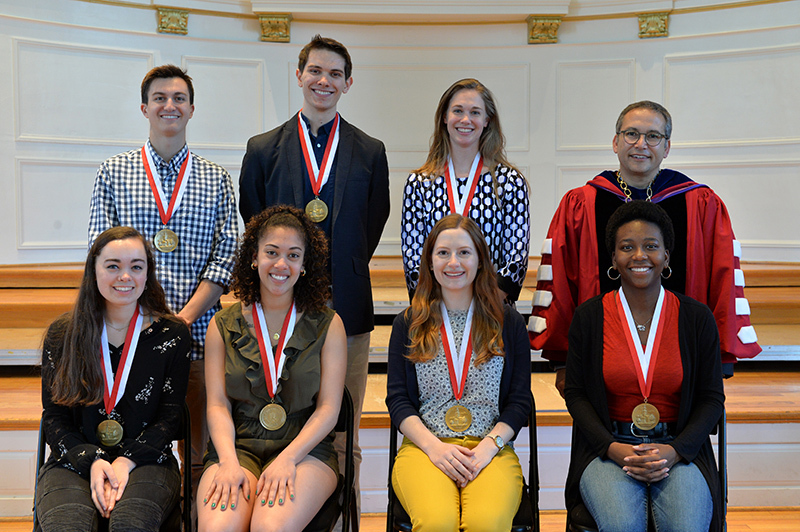 Denison University’s Academic Award Convocation is a crowning event of the academic year, second only to Commencement in the life of the college. 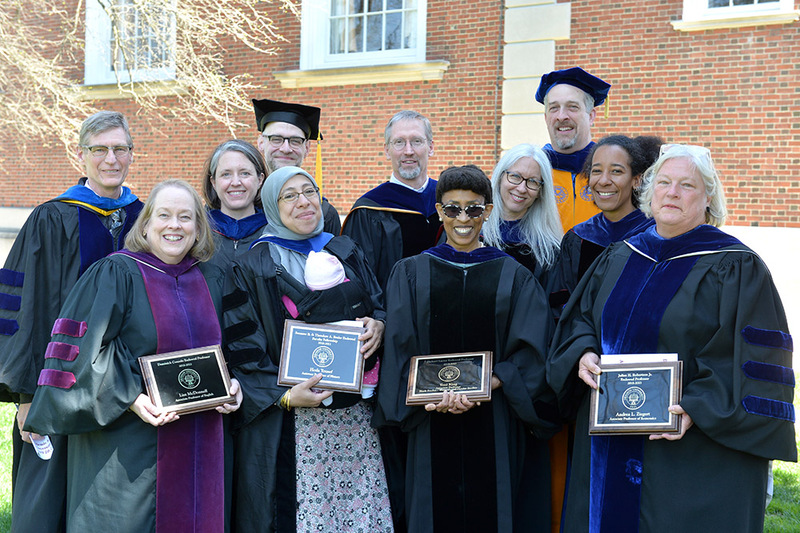 Each April, the campus, including members of the Denison Board of Trustees, gathers to celebrate students and faculty and to highlight excellence in their work. Left to right: Gary Baker, Lisa McDonnell, Karen Spierling, Mark Bryan, Hoda Yousef, Peter Kuhlman, Toni King, Margot Singer, Trey Proctor, Diana Mafe, Andrea Ziegert. 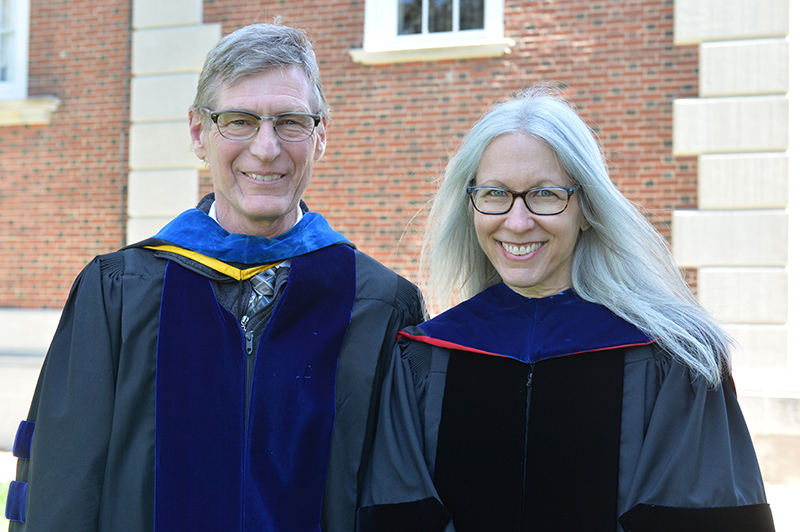 Gary Baker and Margot Singer received the Brickman and Bonar Teaching Excellence awards, respectively. The Charles A. Brickman Teaching Excellence Award, which is given to members of the faculty who are master craftsmen in the profession and models of dedication to students and to student learning, was awarded to Professor of Modern Languages Gary Baker. The Bonar Family Mentoring and Teaching Excellence Award, which recognizes exemplary mentoring and teaching by a Denison faculty member, was awarded to Associate Professor of English Margot Singer. 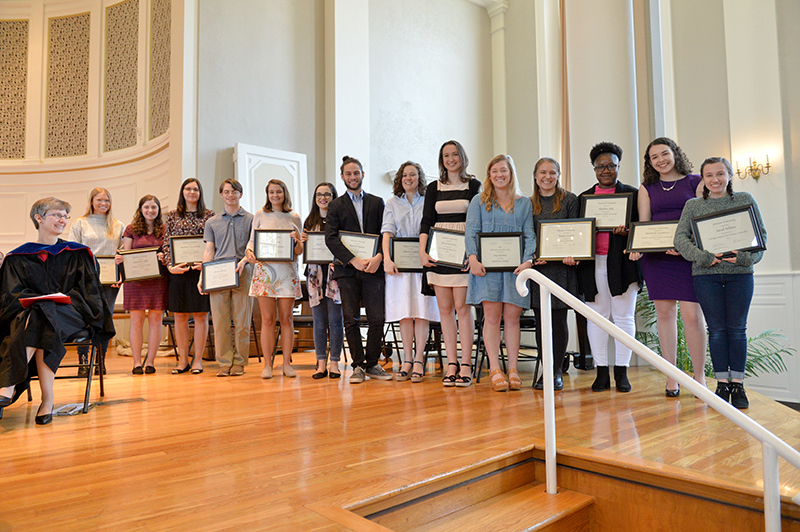 Student inductees into Denison’s chapter of Phi Beta Kappa, the nation’s most established honorary society, were recognized. Denison has been a member of Phi Beta Kappa for more than 100 years, since 1910. 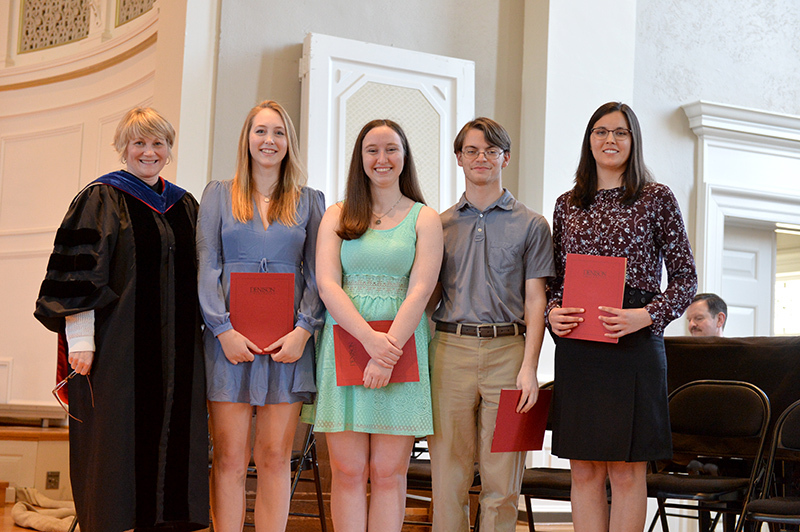 Provost Kim Coplin with Provost’s Award Winners Elizabeth Postema, Jane Bright, Patrick Banner, and Madeline Van Winkle. The Provost’s Academic Excellence Award recognizes those students with the highest academic achievement. This is the first year for these awards. The seniors who received this award are Patrick Banner, Jane Bright, Elizabeth Postema, and Madeline Van Winkle. Left to right: (Dr. Joyce Meredith), Meaghan Wells, Elizabeth Jaffy, Madeline Van Winkle, Patrick Banner, Sarah Curtin, Angela Gloninger, Mitchell Tijerina, Claudia Canfield, Alexandria Seward, Samantha Price, Megan Lovely, RubatuAifa, Kimberly Gutierrez, Sarah Wilson. Rubata Aifa ’18, Chris Baculima ’19, Asher Bergson-Gold ’19, Savannah Delgross ’19, Eizo Lang-Ezekiel ’19, Parker Geho ’19, Elizabeth Jaffy ’19, Julie Lam ’19, Nina Mercado ’19, Hamna Siddiqui ’19, Brandon Wafford ’19, and Meaghan Wells ’19: Benjamin Gilman Scholarships. 2018 President’s Medalists: (back row) Ben Burdick, Oliver Gladfelter, Haley Fiegel, President Adam Weinberg, (front row) Emily Farrow, Jennifer Fajardo, Kelsey Schwimmer, Dajia Dampeer. Finally, a few very accomplished students are chosen as President’s Medalists. Each year, four to eight students are selected for the honor, which was established in 1985 to for academically exceptional students who also embody some combination of the following: service to the community, contribution to the arts, enlargement of the community’s global perspective, athletic fitness and achievement, and/or leadership ability and contribution to community discourse. This year’s recipients are Benjamin Patrick Burdick, Dajia Dampeer, Jennifer Indira Fajardo Ruiz, Emily Mae Farrow, Haley Lynn Fiegel, Oliver Luke Gladfelter, and Kelsey Lynn Schwimmer.